NEW YORK (AP) — Gripped by fear of another recession, the financial markets suffered their worst day Thursday since the crisis of 2008. The Dow Jones industrial average fell more than 500 points, its ninth-steepest decline ever. The sell-off wiped out the Dow’s gains for 2011. It put the Dow and broader stock indexes into what investors call a correction — down 10 percent from the highs of this spring. The day was reminiscent of the wild swings that defined the markets during the crisis three years ago. Gold prices briefly hit a record high, oil fell an extraordinary $5 a barrel, and frightened investors were so desperate to get into some government bonds that they were willing to accept almost no return on their money. For the day, the Dow closed down 512.76 points, at 11,383.68. It was the steepest point decline since Dec. 1, 2008. But what is being “corrected”? The term “correction” implies that something was wrong that needed to be corrected. Most of what I heard yesterday had to do with the ongoing fiscal crisis in the European Union, with the P.I.I.G.S. – Portugal, Ireland, Italy, Greece and Spain – just getting uglier and uglier. Greece was bad enough. But now Italy is going into the crapper, and Italy is just “too big to bail,” to play off the phrase “too big to fail” that “justified” so many of the recent unprecedented bailouts. I don’t doubt that the deteriorating situation in Europe is part of the crisis that is causing the gigantic selloff in the United States that is imploding all of our market indexes. And of course I could now get up on my soapbox and point out that, given that this failed socialist model is crashing down in Europe, WHY THE HELL IS OBAMA AND THE DEMOCRAT PARTY DOING THE SAME CRAP HERE?!?!? And of course, that is still a valid question. But I have a different theory as to what is going on. I think this major market reversal is merely a delayed result of the completely artificial levels created by QE2. And QE2, of course, was the result of our own Obama Federal Reserve machinations. 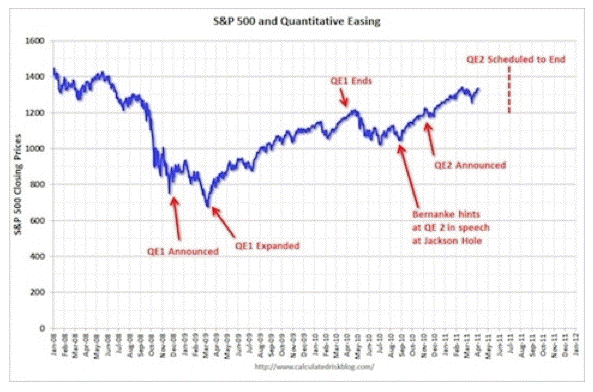 The end of Quantitative Easing Two (QE2) will occur at the end of June 2011. This article is designed to provide an area for focused discussions about the design of counter-plays for a potential sharp reduction in equity valuations. * Why would the end of QE2 cause a sharp reduction in equity valuation? In other words, how does QE2 work? Quantitative easing is a monetary policy used by the Fed to stimulate the US economy. The Fed buys government bonds and other financial assets with new money that the Fed creates (out of thin air), thus increasing the money supply and reserves of the banking system. This action raises the prices of the financial assets bought, which lowers their yield. As the Fed systematically purchases a substantial volume of long-term Treasury bonds and other financial assets (i.e., equities), large financial institutions (i.e., bondholders) shift their wealth into equities to achieve a higher return. In other words, the Fed’s actions reduce risk in the equities market which makes equities a more sensible investment than bonds. 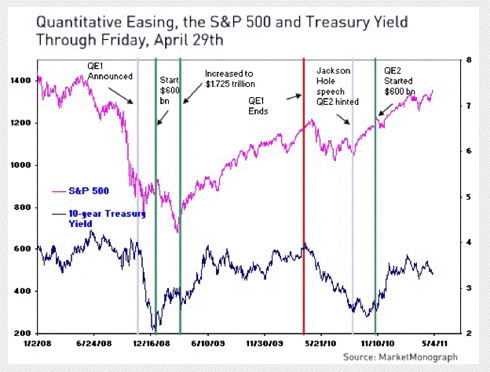 So, simply put, the Fed puts large quantities of money into the markets, inflating the price of equities. Money follows money, and up the market goes. The resulting rise in equity prices increases household wealth, providing a boost to consumer spending. Figure One clearly demonstrates the effect of quantitative easing. Of course, a few data points do not constitute absolute proof that quantitative easing is causal to a stock-market rise, or that stock-market increases cause increases in consumer spending. However, the timing of the stock-market rise, and the lack of any other reason for a sharp rise in consumer spending, makes that chain of events look very plausible. Figure One shows us that shortly after QE1 was announced, the market free fall began to stabilize. After the QE1 program was expanded from 600b to 1.725 trillion, the market sharply reversed. When QE1 ended, the market once again reversed with about a 20% drop. That’s 200 S&P points (2,000 Dow points) over a two month time period. QE2 was then suggested, and the market reversed. At the moment of decision, the market hesitated, then QE2 was announced, and once again, the market sharply increased. The time line of these events is perhaps more clearly demonstrated in Figure Two. Note that as the Fed buys Treasures, the yield stabilizes at about 3.5%. 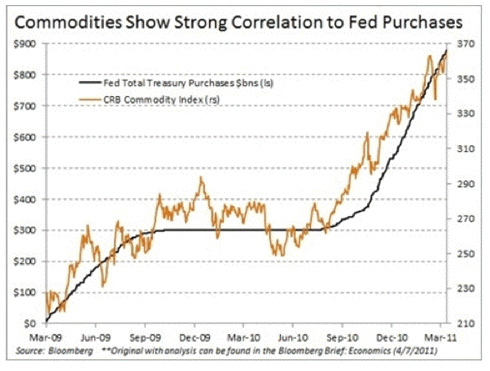 Figure Three demonstrates a clear association between the Fed purchases and commodity prices. Note – the source for this section is based on a published interview with Martin Feldstein, Professor at Harvard. The magnitude of the relationship between the stock-market rise and increases in consumer spending also fit the data. Share ownership (including mutual funds) of American households totals approximately $17 trillion. So a 15% rise in share prices increased household wealth by about $2.5 trillion. Historically, the association between wealth and consumer spending implies that each $100 of incremental wealth raises consumer spending by about four dollars, so $2.5 trillion of additional wealth would be expected to raise consumer spending by roughly $100 billion. That figure matches closely with a drop in household saving and the resulting increase in consumer spending. Since US households’ after-tax income totals $11.4 trillion, an one-percentage-point fall in the saving rate means a decline of saving and a corresponding rise in consumer spending of $114 billion – very close to the rise in consumer spending implied by the increased wealth that resulted from the gain in share prices. Without increases in stock-market wealth, will the savings rate continue to decline and the pace of consumer spending continue to rise more rapidly than GDP? Will the strong economic growth at the end of 2010 be enough to propel more spending by households and businesses in 2011, even though house prices continue to fall and the labor market remains weak? And does artificial support for the bond market and equities mean that we are looking at asset-price bubbles that may come to an end before the year is over? So what does the investor do? Based on what happened at the end of QE1, it appears we can anticipate a 15% to 20% drop in the overall market. Are their any market sectors that would provide safety? Talking about this new Keynesian tactic of quantitative easing with a financial whiz is kind of like the opposite side of talking to a financial whiz about gold. Gold is routinely pooh-poohed by financial whizzes because if people bought gold, they wouldn’t need all of the damned financial whizzes, now would they? QE1 and QE2 were abject disasters. And I don’t doubt for a second that the “correction” that we saw yesterday – and from all accounts will see again today given the Asian market bloodbath – was in large part a delayed reaction to the end of the sugar high of QE2. Particularly given that Fed Chairman Ben Bernanke said, “There will be no QE3 for the moment, but QE2 won’t come to an abrupt halt at the end of June either.” Which is to say that nobody really knew when to start the selloff after the end of the last sugar high. But what do I know (or the above fool, for that matter?)? With markets tanking, and the economy weakening, buzz about the Fed doing QE3 has really heated up. The FOMC meets next week, and the Jackson Hole conference (where QE2 was announce) happens soon thereafter. But arguably, the next round of general easing has begun. Yesterday at 3:00 AM the Swiss lowered interest rates to stem the rise of the Franc, and last night Japan intervened to make its currency weaker. And then today, the ECB confirmed more bond buying, so however you slice it, the central banks are back into easing mode.